This book first arose out of a passage in Borges, out of the laughter that shattered, as I read the passage, all the familiar landmarks of my thought - our thought, the thought that bears the stamp of our age and our geography - breaking up all the ordered surfaces and all the planes with which we are accustomed to tame the wild profusion of existing things, and continuing long afterwards to disturb and threaten with collapse our age-old distinction between the Same and the Other. (n) that from a long way off look like flies’. Jullien's Propensity of Things removes the mystery of this effect when he explains that such collections are indeed an alternative system of knowledge, functioning not like Western abstract categories that unify by genus and species according to shared properties, but a series of positions (shi) for performing some skill, anything from playing the flute to the equivalent of the kama sutra. Chinese knowledge does not work with concepts and definitions, but gathers into coherence by means of networks of affinities and contrasts, correlations. The relay for a heuretics of electrate metaphysics is the refinement of the very notion of "apparatus" itself, the resonance between the "disposition" or configuration of a situation, producing a potentiality, with dispositif and the Wide Image matrix. Works of art, especially landscape painting, are the prototype for actualizing and exploring a specific "set-up," and set-up as such. The formal coherence of relationships within a set up, the design of tensions, the style (efficacy) of the design, create an effect of vitality. This vitality or dynamism has metaphysical significance, emblematized in the dragon as the icon of a Chinese disposition. The vitality or dynamism experienced in making and contemplating art directly concerns our inquiry into metaphysics, with ontology as the study precisely of being (life). The feeling of vitality in art expresses the force of being. A rule for heuretic instructions is to note in Jullien any points of analogy, as well as direct comparison/contrast between East and West. 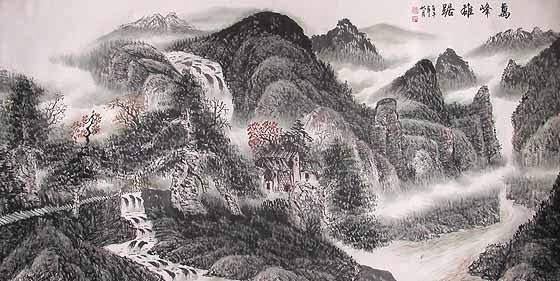 The categorial theme concerns shi as the guiding notion for observing Chinese metaphysics (despite Jullien claiming that Chinese landscape painting evokes the invisible force governing reality without resorting to metaphysics). The instruction is first to locate the relationship, and then to ask: what is that for electracy (to be answered by means of the CATTt)? There are numerous useful analogies, but the one featured here as instruction is the following (commenting on the list of shi or positions for learning a skill such as playing a musical instrument). These positions in movement (and of movement) defy thought cast in the mold of dichotomies. For us too, the only way to describe them is through metaphor, by resorting to a cinematographic technique, for instance, and envisaging these series of shi as so many "freeze frames." Alternatively, using the terms of graphic representation, one might liken them to "sections" made for a drawing of an object imagined as divided across planes; the series of shi could thus be thought of as so many different sections cut through a continuous movement. Each section reveals in itself a fixed plane, but one reads it as a "configuration" matching the dynamic force invested in it (114). The choice of this particular analogy (shi as cinematographic freeze frame), is motivated by our CATTt Analogy-- a book on "Cinematics," treating artists's explorations of relations between photography and cinema. The instruction is: Art forms capture and realize potential set-ups, even in an experimental way. Specifically, be alert for a pattern (a configuration) emerging across the CATTt referencing freeze frame and related photographic and filmic devices.